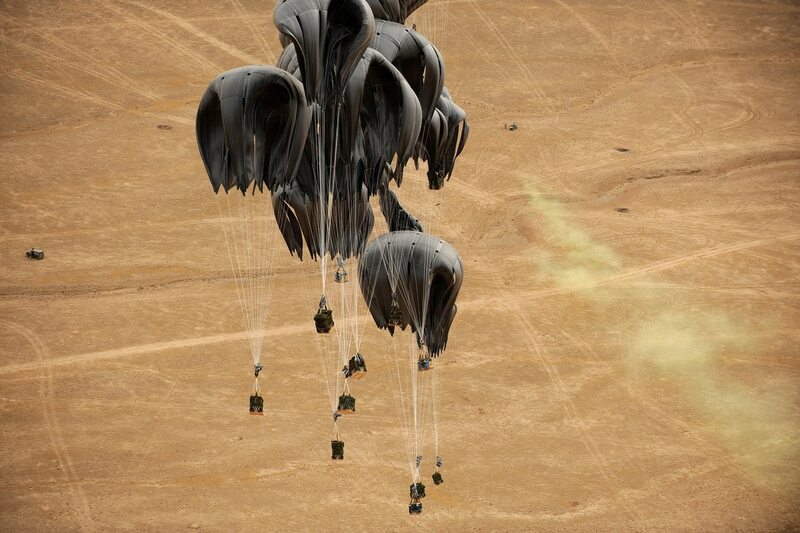 Container delivery system bundles parachute down to a drop zone marked by warfighters on the ground, May 9, 2010, in Afghanistan. The Air Force is ready to airdrop aid to besieged Syrian cities if asked, Secretary Deborah Lee James said Thursday. "If we're asked to do it, we have the access, we have the people, we know how to do air drops," she said at the Center for Strategic and International Studies. "This is something that certainly we have done and we can do and we will do if we're tasked to do it." The secretary's response was prompted by a question about the widely-reporting mass starvations in some Syrian towns, including Madaya, which have been blockaded by the forces of President Bashar al-Assad or the rebels trying to depose him. Only within the past week were United Nations aid convoys able to reach the towns to deliver food and transport dozens of doctors and aid workers to treat the civilians there. The Air Force has delivered aid before, James said, such as in 2014 when the service airdropped supplies to Yazidis who were trapped on mountaintops in Iraq, surrounded by Islamic State extremists. "As for the refugee camps and the misery that so many of the Syrian people are going through, the United States - and this gets back to the whole of government approach - we are supporting," James said. "We are the largest donors of humanitarian aid. We're sending dollars and there are other distribution systems, as far as I understand it, to try to get aid to those who are suffering in the camps." Meanwhile, the entry of Russia into the Syrian conflict has been a "complication," James said. "There's no question about it," she said. "As Secretary of the Air Force, I do worry about people and my people in particular, so it is a concern." The Pentagon however, has now established reliable communication with Russia. "We do have an understanding," James said. "It's not a coordination, but it's a way of communicating with Russia. It's tested daily, literally, to make sure that the frequency is working." It's a way for both nations to "de-conflict ourselves in the skies" and avoid a larger conflict, James said. "If someone were to miscalculate, or if there were to be an accident, it could mean not only death for the people involved but it could also have higher ramifications," she said. "So I certainly feel a lot better now that we have this communication situation in place." For now, James said the U.S. has decided not to set up a no-fly zone over Syria – something it has done in previous conflicts. "If we're asked to do it, we can do it," she said. "If we were to have a no fly zone that would mean essentially that there would be territory that if other aircraft enter that territory that they would be at risk of getting shot down." The question, the secretary said, is the purpose of the no fly zone and who it would be targeting. "Well, of course ISIL doesn't have aircraft," James said, referring to the terrorist group by an alternative acronym. "You wouldn't be doing this against ISIL, so who would you do this against? Would you do this against Russia, would you do this against Assad?" "These are the higher level questions, and for now at least our government has said this is not the way that we are going to participate," she continued. Phillip Swarts can be reached at pswarts@airforcetimes.com and you can follow him on Twitter at @PFSwarts.